You know, there’s lots of work being done in old cities around the world. Lots of renovation, repairs and construction. I’m happy to lend my likeness to any scaffolding that wants me. Just wish I knew where this place was. Any ideas? There’s a slight give away in the wording below the scaffold. But I can’t read it. My eyebrows are getting in the way. Oh peep….got any scissors? The blunt end kind. Don’t want you to put my eyes out…. 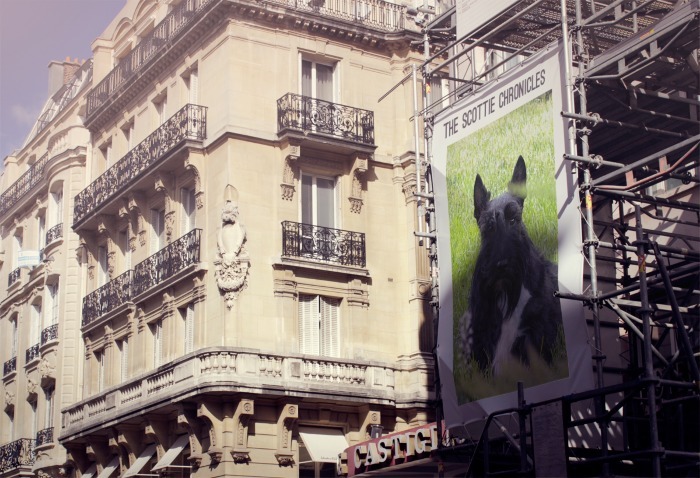 This entry was posted in The Scottie Chronicles and tagged dogs, pets, photography, Scotties, travel. Bookmark the permalink. 8 Responses to Where In The World? Well, Stu, with your hint I am going to guess that’s an Italian restaurant in Fredericksburg, VA.
Don’t cut the eyebrows, they enhance your debonair look. As usual, Stu. You’re off the wall. We will guess Paris, noting the scroll work on the wrought iron railings, but then again, we are just wildly guessing. AROOOOOOOOO! Having never left north America, we are clueless.